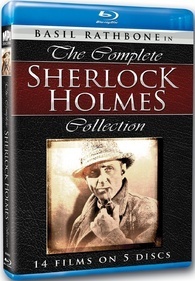 The films include: The Hound of the Baskervilles, The Adventures of Sherlock Holmes, Sherlock Holmes and the Voice of Terror, Sherlock Holmes and the Secret Weapon, Sherlock Holmes in Washington, Sherlock Holmes Faces Death, The Spider Woman, The Scarlet Claw, The Pearl of Death, The House of Fear, The Woman in Green, Pursuit to Algiers, Terror by Night, and Dressed to Kill. The set will come with five discs, all which are bluray. Sadly, no word on EXTRAS yet, but give it time. I am hoping they go all out on this edition. You can pre order the set by clicking the picture link below. Pre-order sale price is less than $100.00. The SRP is $130.00. This entry was posted on Wednesday, February 9th, 2011 at 4:14 pm	and is filed under Film, News. You can follow any responses to this entry through the RSS 2.0 feed. You can skip to the end and leave a response. Pinging is currently not allowed. « Check Out Master of Voodoo and Vampirium by the up and coming Author, Justin Cline!! !